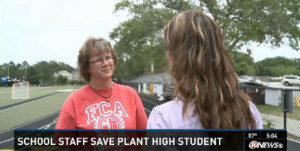 During a physical education test, a 16-year-old student dropped on the race track of Plant High School in Tampa, Florida. The first witness to the accident was Carrie Mahon, a coach of 12 years at the high school, notes that this is a first for her; she’s never seen a student fall over unresponsive before. “We got on the radio and called for help,” she said. Grabbing an automated external defibrillator (AED) from a concession stand 20 ft. away, the school nurse began CPR while Figueredo assisted with the AED. They had to use the AED twice, but the boy thankfully began to breath again before emergency services arrived and took him to Tampa General Hospital. 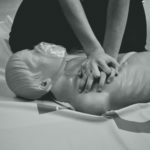 Student CPR is a program designed to educate and equip school faculty, staff, and students alike so that should an accident occur, schools are empowered to rescue the valuable individuals who attend and work there. 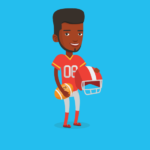 You can submit your school for our free CPR program, so that students there can learn CPR and give them the skills to potentially rescue a victim confidently should the need ever arise.